Metal roofing offers greater resistance against damage from moisture and sunlight, leading to a longer lasting roof. Standing seam roofs use raised edges to direct water off of the roof and prevent puddles that damage the underlying structure. Systems that use the snap lock assembly process are easier and faster to install than other types of metal roofing. Ridges keep water out of the seams between panels. 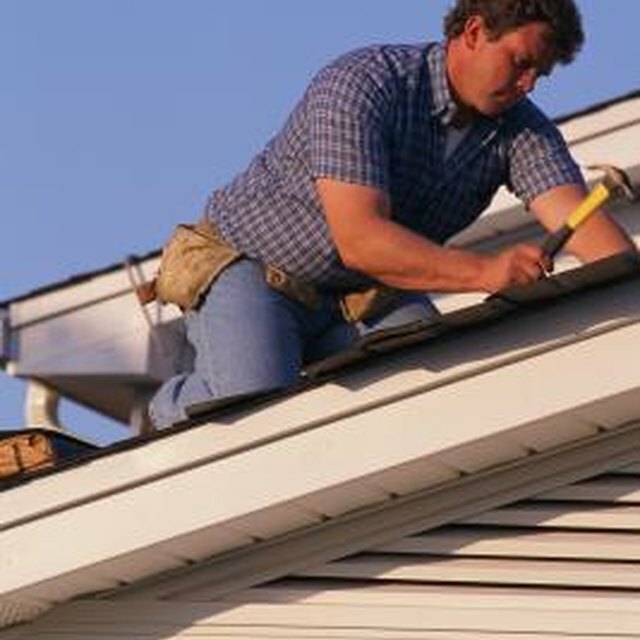 The roofing process begins with a sturdy roof deck. The sheathing requires an underlayment of asphalt roofing paper with a weight of 30 pounds per square foot, according to Summit Pacific Metal Sales. Rubber membranes also work for standing seam metal roofs. Once the underlayment is down, matching metal trim is nailed around the edge of the roof. The eaves and the ridgeline require the trim to cover areas where the metal panels will meet at an angle or end. Snap lock standing seam roof panels hide the fasteners that secure them to the decking under the ridges that snap together. A special starter panel is nailed down first. Two panels snap onto this starter, covering the rows of fasteners. Each standard panel has one row of fasteners. Corrosion resistant roofing nails prevent rust from damaging the standing seam metal roof, and flexible washers should be used to ensure no water leaks through. As you fasten each standard panel to the roof, you snap the next piece over the edge of the last. The standing seam metal sheets come with a preformed lip that hooks the edges of the panels together. You will want to use a soft rubber mallet to help snap these edges together. When a panel runs to the edge of the roof, it needs to overlap the metal trim you already installed. Overlapping the sheets of a snap lock standing seam metal roof system is not enough to keep water from leaking through the roof. Homeowners must use the right sealants around protrusions through the roof like chimneys or fasteners. Butyl tape and caulk adheres correctly to the coated metal, according to Summit Pacific Metal Sales. These sealants are also flexible enough to deal with the natural expansion of metal roofing.